Initially, it was Rohit Sharma, who won the toss, elected to field first, as there is rich history for chasing teams in Wankhede Stadium. Meanwhile, the flamboyant striker of the ball Virat Kohli walked back for a cheap score when Jason Behrendorff bowled a peach of the delivery in the third over of the game. In between, AB de Villiers played a brilliant inning for the team. Unlike his quick starts, he played with an intent and a bit like run-a-ball knock to settle in the innings/. After scoring 31 runs off 30 balls, he took on Lasith Malinga to whack a massive six while Moeen Ali smashed it brilliantly for the team. Ali looked in an ominous form, especially, against spinners. His quick knock helped Royal Challengers Bangalore to get 119 runs in the 15 overs before taking the second strategic timeout. In the very next over, Moeen Ali took on Jason to smash 17 runs off the over. However, Lasith Malinga came to the rescue for Mumbai, who dismissed Moeen Ali in the 17th over of the game. Ali was quickly followed by Marcus Stoinis, who was outfoxed by Lasith’s slower delivery. Mumbai Indians were given a total of 172 by Royal Challenger Banglore. 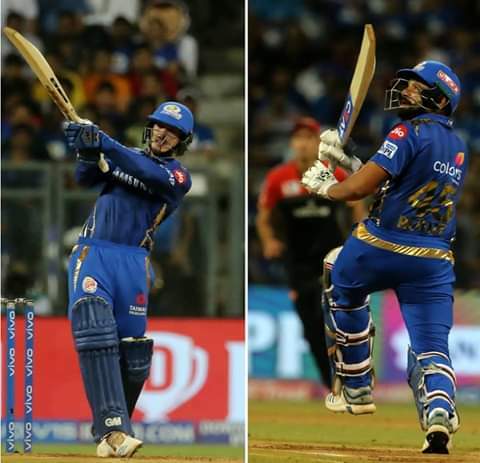 Rohit Sharma and Quinton de Kock started for Mumbai. Both batsmen looked great but Rohit got out on a steamy ball by Ali. De Kock started very aggressive batting and smashed Umesh Yadav for two boundaries as Mumbai get off to a good start. De Kock on the fourth ball of Umesh Yadav hit him a huge six which went on the last tier of ground. Moeen Ali strikes again. 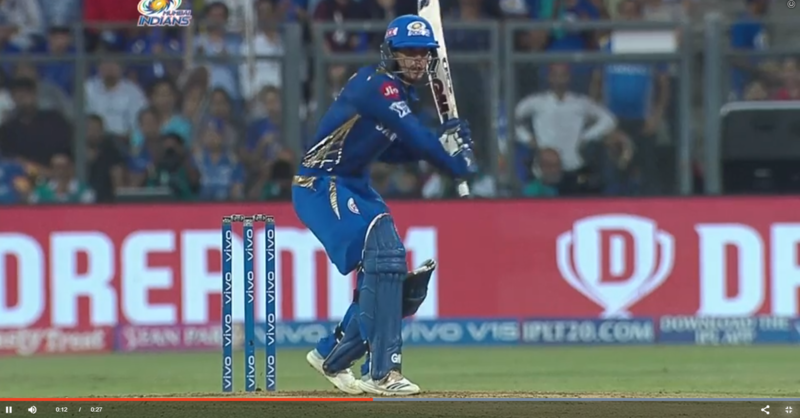 Soon after removing Rohit, the Bangalore bowler caught de Kock leg before wicket off the fourth delivery of the 18th over. The South African fell 10 runs short of a half-century.